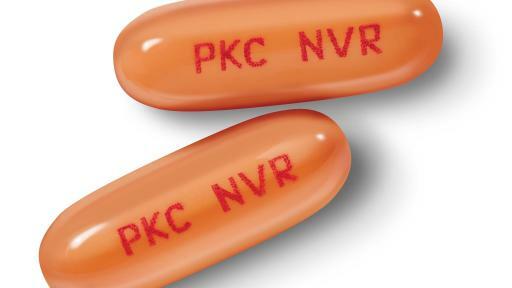 EAST HANOVER, N.J., April 28th, 2017 – Novartis announced today the US Food and Drug Administration (FDA) has approved Rydapt® (midostaurin, formerly PKC412) for two indications. 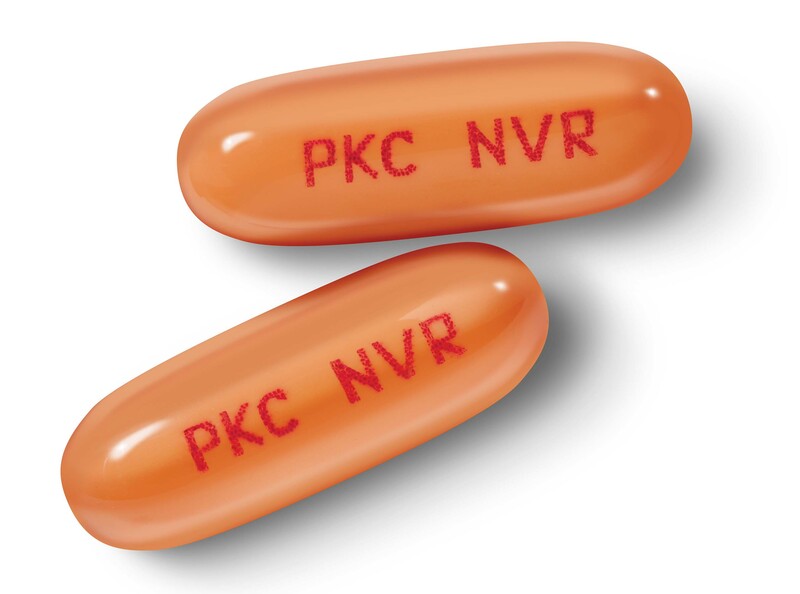 The first indication is for the treatment of acute myeloid leukemia (AML) in newly diagnosed patients who are FMS-like tyrosine kinase 3 mutation-positive (FLT3+), as detected by an FDA-approved test, in combination with chemotherapy3. Rydapt is also approved to treat adults with advanced systemic mastocytosis (SM), which includes aggressive systemic mastocytosis (ASM), systemic mastocytosis with associated hematological neoplasm (SM-AHN) and mast cell leukemia3. This approval follows a prior Breakthrough Therapy designation in FLT3-mutated AML, as well as Orphan Drug designation and Priority Review in both indications by the FDA. Worldwide filings for Rydapt are currently underway. AML is a rare and aggressive cancer of the blood and bone marrow4. In the US, about 21,000 people are estimated to be diagnosed with AML in 20175. 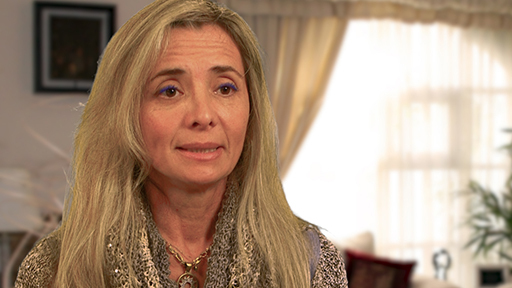 Approximately one-third of these AML patients, or 7,000, will have a FLT3 gene mutation6. FLT3 is a type of cell-surface receptor which plays a role in increasing the number of certain blood cells7. The FLT3 gene mutation can result in faster disease progression, higher relapse rates and lower rates of survival than other forms of AML6,7,8. 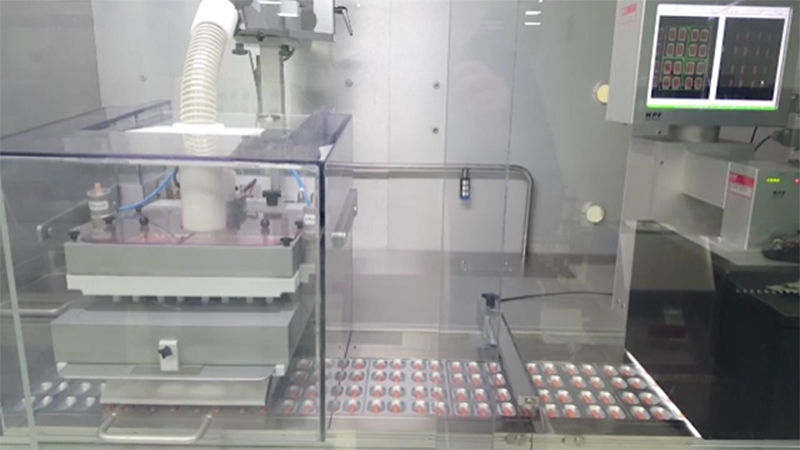 Prior to the approval of Rydapt, the AML therapeutic strategy had remained relatively unchanged for more than 25 years1,2. 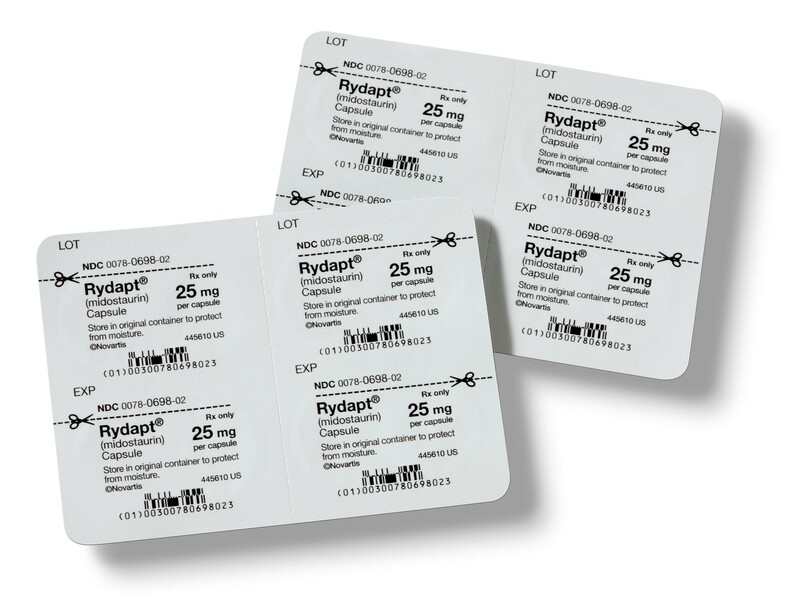 Rydapt is indicated for use in combination with standard cytarabine and daunorubicin induction and cytarabine consolidation chemotherapy, for the treatment of adult patients with newly diagnosed AML who are FLT3 mutation-positive, as detected by an FDA-approved test3. 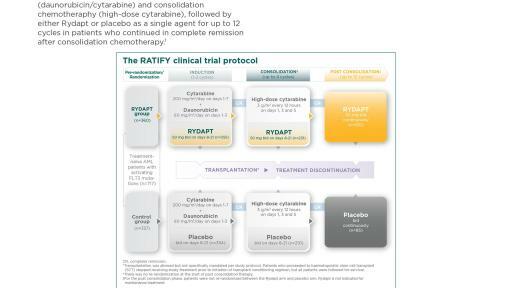 Rydapt is not indicated as a single-agent induction therapy for the treatment of patients with AML3. The FDA approval is based on the Phase III RATIFY (CALGB 10603 [Alliance]) clinical trial, which was conducted in collaboration with the Alliance for Clinical Trials in Oncology and its 13 contributing international cooperative groups. In the trial, newly diagnosed FLT3+ patients who received Rydapt plus chemotherapy experienced significant improvement in overall survival with a 23% reduction in the risk of death compared with chemotherapy alone (hazard ratio [HR] = 0.77, 95% confidence interval [CI], 0.63, 0.95; 2 sided p=0.016)3. Event-free survival (EFS; event defined as no complete remission within 60 days of the start of induction therapy, relapse or death) was significantly higher for Rydapt plus chemotherapy versus chemotherapy alone (median of 8.2 months compared to 3.0 months, HR = 0.78, 95% CI 0.66, 0.93 and 2 sided p=0.004)3. RATIFY is the largest worldwide clinical trial in newly diagnosed FLT3-mutated AML to date, as 3,279 AML patients were screened for the FLT3 mutation and 717 patients were enrolled9. All FLT3+ patients enrolled in the trial were treated regardless of whether or not cytogenetic status was normal or abnormal3. The most frequent adverse reactions (incidence greater than or equal to 20%) in the Rydapt plus chemotherapy arm were febrile neutropenia, nausea, vomiting, mucositis, headache, musculoskeletal pain, petechiae (small red skin spots), device-related infection, epistaxis, hyperglycemia and upper respiratory tract infections. The most frequent Grade 3/4 adverse reactions (incidence greater than or equal to 10%) were febrile neutropenia, device-related infection and mucositis3. Advanced SM is a rare blood disorder characterized by uncontrolled growth and accumulation of mast cells – or mediators of allergic responses – in one or more organs10. In advanced SM, mast cells accumulate in such high quantities that they begin to cause organ damage10. Median overall survival is currently less than six months for mast cell leukemia11, two years for SM-AHN and 3.5 years for ASM12. 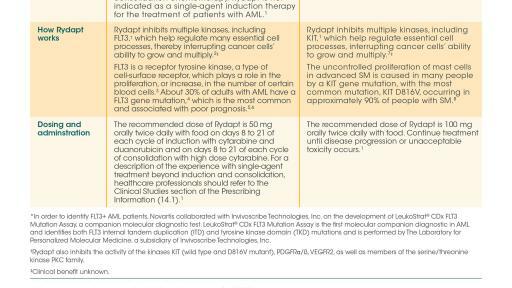 Rydapt is approved in the US for the treatment of adult patients with ASM, SM-AHN, or mast cell leukemia3. 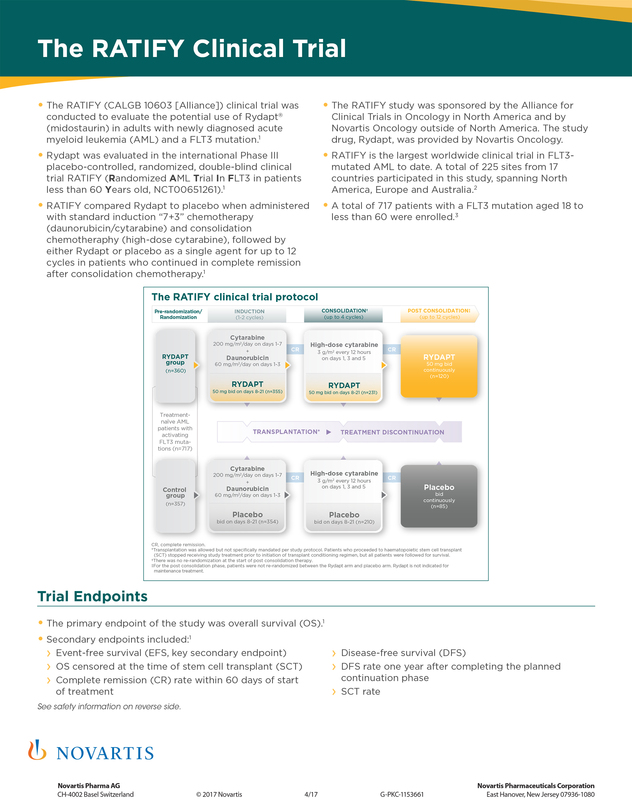 The approval of Rydapt was based on two single-arm open-label multicenter trials, including the Phase II study (CPKC412D2201), which was the largest and longest-running prospective trial ever conducted in this ultra-rare disorder. The efficacy of Rydapt was established on the basis of confirmed complete remission (CR) plus incomplete remission (ICR) by six cycles of treatment per the modified Valent criteria (n=89), in which CR and ICR are the two most rigorous subcategories of a major response. This analysis demonstrated an overall response rate of 21% (95% CI, 13, 31)3. Efficacy was also assessed in a post-hoc analysis using the 2013 International Working Group-Myeloproliferative Neoplasms Research and Treatment-European Competence Network on Mastocytosis (IWG-MRT-ECNM) consensus criteria (n=115)2. This assessment estimated complete remission or partial remission rate of 17% (95% CI, 10, 25)3. The most frequent adverse reactions (incidence greater than or equal to 20%), excluding laboratory terms, were nausea, vomiting, diarrhea, edema, musculoskeletal pain, abdominal pain, fatigue, upper respiratory tract infection, constipation, pyrexia, headache and dyspnea. The most frequent Grade 3 or greater adverse reactions (incidence greater than or equal to 5%), excluding laboratory terms, were fatigue, sepsis, gastrointestinal hemorrhage, pneumonia, diarrhea, febrile neutropenia, edema, dyspnea, nausea, vomiting, abdominal pain and renal insufficiency3. Novartis is committed to providing patients with access to medicines, as well as resources and support to address a range of needs. 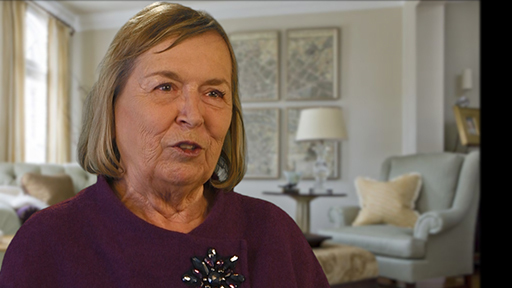 The Rydapt patient support program is available to help guide eligible patients through the various aspects of their treatment journey, from providing educational information to helping them understand their insurance coverage and identify potential financial assistance options. Novartis is offering an innovative indication-based rebate offer to payers related to advanced SM utilization, which will require a patient cost-savings provision. Payers interested in the advanced SM rebate program can call 800-310-6644. 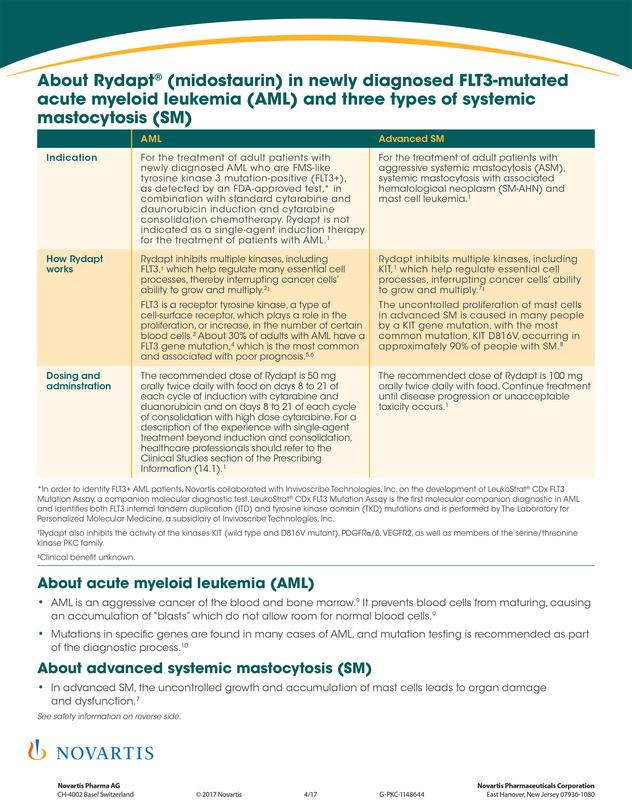 AML is the most common acute leukemia in adults; it accounts for approximately 25% of all adult leukemias worldwide, with the highest incidence rates occurring in the US, Europe and Australia13. It also has the lowest survival rate of all adult leukemias13. AML prevents white blood cells from maturing, causing an accumulation of “blasts,” which do not allow room for the normal blood cells4. Mutations in specific genes are found in many cases of AML6, and genetic testing for mutations in newly diagnosed AML patients can help to determine prognosis and potential treatment strategies14. In advanced SM, the uncontrolled growth of neoplastic mast cells causes organ damage (e.g., liver dysfunction), low blood counts and weight loss10. Patients also suffer from debilitating systemic symptoms such as pruritus (severe itching of the skin) caused by mast cells releasing inflammatory mediators, such as histamine, into the blood10. The uncontrolled proliferation of mast cells is caused in many people by a KIT gene mutation – the most common mutation, encoding the D816V substitution, occurs in approximately 90% of patients15. The KIT gene mutation results in activation of the KIT enzyme, which triggers the abnormal proliferation and survival of mast cells16. 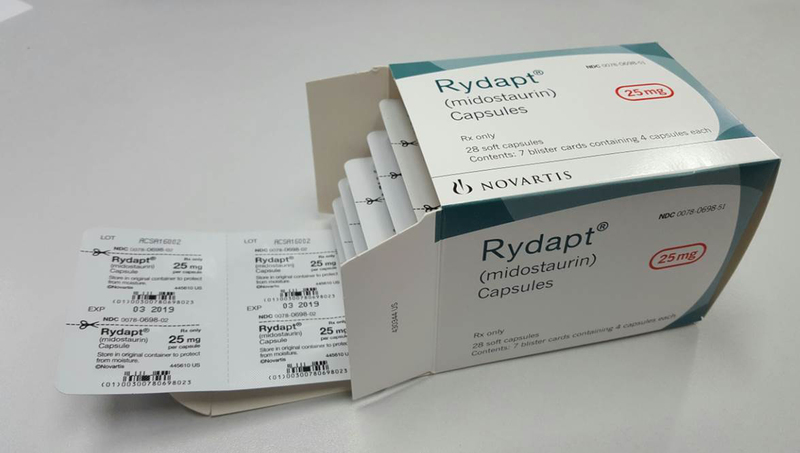 Rydapt® (midostaurin) is an oral, multi-targeted inhibitor of multiple kinases, including FLT3 and KIT, which help regulate many essential cell processes, interrupting cancer cells’ ability to grow and multiply3. Rydapt is available in 25 mg capsules. In AML, the recommended dosage for Rydapt is 50 mg orally twice daily on days 8 to 21 each cycle of induction therapy and on days 8 to 21 each cycle of consolidation therapy3. For a description of the experience with single-agent treatment beyond induction and consolidation, healthcare professionals should refer to the Clinical Studies section of the Prescribing Information (14.1)3. In advanced SM, the recommended dosage for Rydapt is 100 mg orally twice daily3. 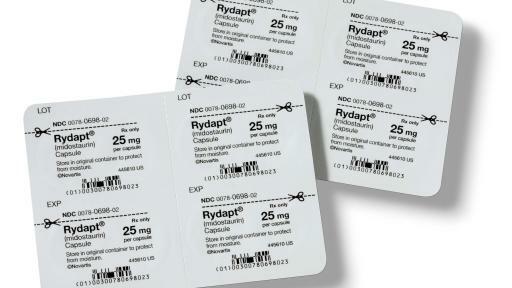 The foregoing release contains forward-looking statements that can be identified by words such as “Breakthrough Therapy designation,” “Priority Review,” “underway,” “work diligently,” “may,” “committed,” “offering,” “will,” or similar terms, or by express or implied discussions regarding potential additional marketing approvals for Rydapt, or regarding potential future revenues from Rydapt. You should not place undue reliance on these statements. Such forward-looking statements are based on the current beliefs and expectations of management regarding future events, and are subject to significant known and unknown risks and uncertainties. Should one or more of these risks or uncertainties materialize, or should underlying assumptions prove incorrect, actual results may vary materially from those set forth in the forward-looking statements. There can be no guarantee that Rydapt will be submitted or approved for sale in any additional markets, or at any particular time. Nor can there be any guarantee that Rydapt will be commercially successful in the future. In particular, management’s expectations regarding Rydapt could be affected by, among other things, the uncertainties inherent in research and development, including clinical trial results and additional analysis of existing clinical data; regulatory actions or delays or government regulation generally; the company’s ability to obtain or maintain proprietary intellectual property protection; general economic and industry conditions; global trends toward health care cost containment, including ongoing pricing pressures; safety, quality or manufacturing issues, and other risks and factors referred to in Novartis AG’s current Form 20-F on file with the US Securities and Exchange Commission. Novartis is providing the information in this press release as of this date and does not undertake any obligation to update any forward-looking statements contained in this press release as a result of new information, future events or otherwise. Yanada M, Matsuo K, Suzuki T, et al. Prognostic significance of FLT3 internal tandem duplication and tyrosine kinase domain mutations for acute myeloid leukemia: a meta-analysis. Leukemia. 2005;19(8):1345–1349.